This last trip we were lucky enough to go to Mickey’s Not So Scary Halloween Party not once but twice. The first party was with our 20 month old daughter Kaitlyn. The second time a few days later with just Adolfo and myself with the assistance of a friend who babysat for the night. It had been a solid three years since our last Halloween party and the experience was a lot different from my previous one. I want to start off with this year’s new additions to Mickey’s Not So Scary Halloween Party. The Storybook Circus Disney Junior Jam is a new dance party with Disney Jr characters. From what we saw that included Doc McStuffins, and that was it. It was also really empty. There were only a few kids dancing. Honestly it felt like a waste of space and a failed attempt at crowd control. If there were more characters this could be a lot of fun. The Mad Tea Party got a fun makeover with a new electronic soundtrack and lighting scheme. This is great for the kids. It’s as close to a rave as your ever going to get at Walt Disney World. O yea and it shoots green lasers…. that was pretty cool. Pirates of the Caribbean had the addition of live actor characters on the attraction. This included two pirates in the queue with an infamous pirate (Gunpowder Pete) that you need to find while on the ride. This makeover had so much potential and I’m really sad it missed the mark. The first pirate we encountered was in a cellar in the main part of the queue. The first time we went through the line there wasn’t a pirate and the second time he was literally sitting on a box doing nothing. No talking, or really looking at anyone. He looked completely checked out. It was underwhelming. We rode this multiple times and each time we were shuffled onto the right side of the line when you reach the boat launch. Before you load the boats there is a Pirate on the loading dock giving a huge enthusiastic rant about Gunpowder Pete. He really wants the reward money. This pirate was interacting with the crowd but only if you had been directed to the left. Everyone on the right side could hear him but that was it. He didn’t look over to our side at all or interact with anyone on our side of the queue. Last but not least there is all of this build up to finding Gunpowder Pete and you see him for all of two seconds. He yells at you a bit, cracks a joke, and you are on your way. The line was only 20 minutes long and Pirates of the Caribbean is a family favorite but we felt that this addition fell short of the hype. Now it’s time for the show stopper. Space Mountain in the dark. This was so much fun and terrifying at the same time. They are playing super loud rock music while you are going through and it just adds a little something special to the ride. If you know the ride turn by turn you might be a little disappointed but we all thought it was a lot of fun. Please if you do this do not take away from the illusion by turning on your cellphone. (This happened to us twice and it broke the spell for a second until we had passed the other car). Now that Instagram has taken over the world there are longer lines for the specialty treats. People need get the perfect gram! Gotta get those likes right? You can easily end up waiting in half hour lines to grab some goodies. While we love the specialty treats, that’s really not something we want to spend our time on while at the Halloween Party. We like to hit the treats up early if we can but this years lines were so bad we only got to try two things. Totally lame, we know, but we really wanted to watch the parade this year so we spent a lot of time hunkered down on Main Street. The two items we did get to try were the Not So Poison Apple Cupcake and the Zero Pumpkin Waffle Caramel Sundae. 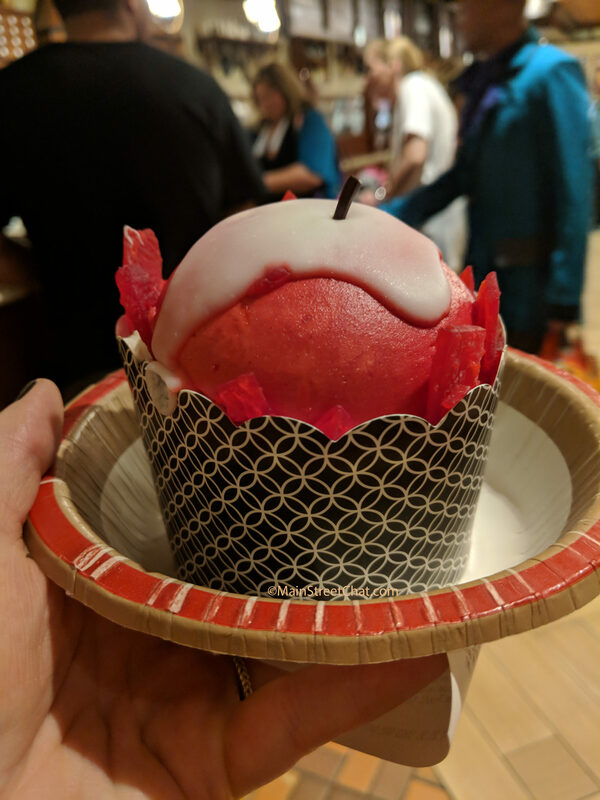 The Not So Poison Apple Cupcake is available at the Main Street Bakery and it’s a beautifully constructed desert. It was MADE for Instagram, seriously. That, however, is the best thing we can say about it. It’s sugar on top of more sugar and doesn’t have any distinctive taste besides being super sweet. You have two inches of vanilla frosting, a very small portion of spice cupcake (where you can kind of taste some cinnamon in there but was still super sweet) and a pecan praline between the two. For some reason when Disney makes a pretty desert it often doesn’t taste good, just photographs well. 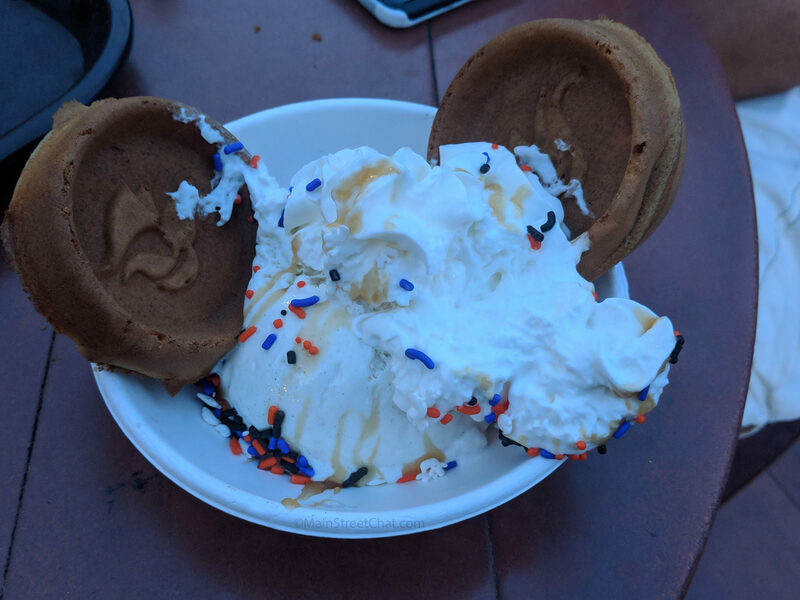 The Zero Pumpkin Waffle Caramel Sundae is available at Sleepy Hollow Refreshments and can I just say WOW. This was so so good. The Waffles were adorable with Zero on them! I’m a sucker for Nightmare Before Christmas and loved this. They actually tasted good. Classic Mickey waffles with a touch of pumpkin and spices. The ice cream was a very good vanilla bean, covered in caramel sauce, whipped cream and black and orange sprinkles. I’m going to go on a mini rant here. We don’t consider ourselves foodies per say, we don’t care about how pretty something is, we care about how it tastes. This sundae was so good! We really wished Disney would up their whip cream game and use a professional whip cream dispenser instead of the pre-made stuff you can find at the grocery store.. Okay, rant over. We would very happily get this every time we go. Next time Adolfo would have to get his own. I’m not sharing…. There are many more specialty desserts available at the Party but I don’t want to go into them when we didn’t have the opportunity to try them. The only one I will mention is the Candy Corn Ice Cream available in Tomorrowland. I just want to give a heads up that this is not actually candy corn flavored. It’s vanilla soft serve with orange food coloring. Next week we will discuss what else happened at Mickey’s Not So Scary Halloween Party! The entertainment, fireworks, parade and Hocus Pocus villains show. As well as an interesting experience we had waiting for the parade. Thanks for reading!!! Have you been to Mickey’s Not So Scary Halloween Party? Let us know about your experiences and opinions.